Venable is a Law Firm located in Chinatown, Washington, DC. The company has beautiful lactation room suites located on each floor for their employees. 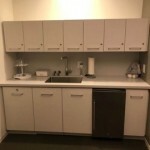 The “mom rooms” are a separate designated private space that include a comfortable chair, a refrigerator available for breastmilk storage, a sink for cleaning of pump supplies and a locked storage space for employees to store their personal use breast pumps and other supplies. 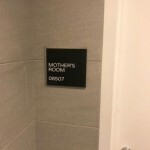 The rooms also include a floating desk and a phone if mothers choose to do work during pumping or want to participate in a conference call. Venable offers paid maternity leave to all staff for at least 6 weeks and up to 6 months for attorneys with other telecommuting and part-time work options once they return to work. Venable truly cares about their mothers, they reach out to the moms after they have the baby to see how they are doing and let them know about available resources in the area including breastfeeding classes, mental health services and other postpartum services.